Every space has a story to tell. For designer Johnson Chou, spaces tell the stories of the people who occupy them. 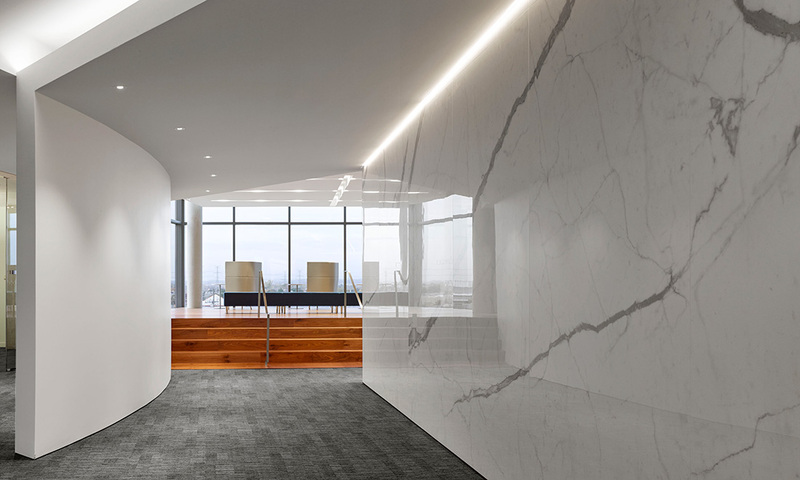 Relying on metaphors presented in materials and form, the firm develops for each client a three-dimensional story that “explains itself as one walks through the space.” Every decision is carefully considered to underscore the narrative Chou and his team has created. 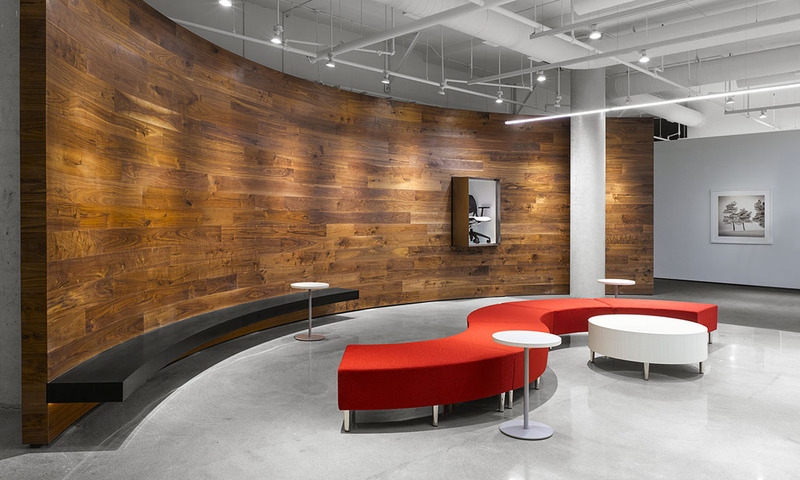 Envision with River seating in Global Showroom Toronto. And these narratives have certainly resonated with the judges of the ARIDO Awards. Johnson Chou Inc. received two 2017 ARIDO Awards for their most recent projects, Mosaic Chicago and the Global Showroom in Toronto. Mosaic Chicago is a five-story, 40,000 square foot office located in the vibrant Fulton Market neighborhood popular amongst tech companies. The growing sales and marketing agency wanted their new office to depict their culture of collaboration and transparency. 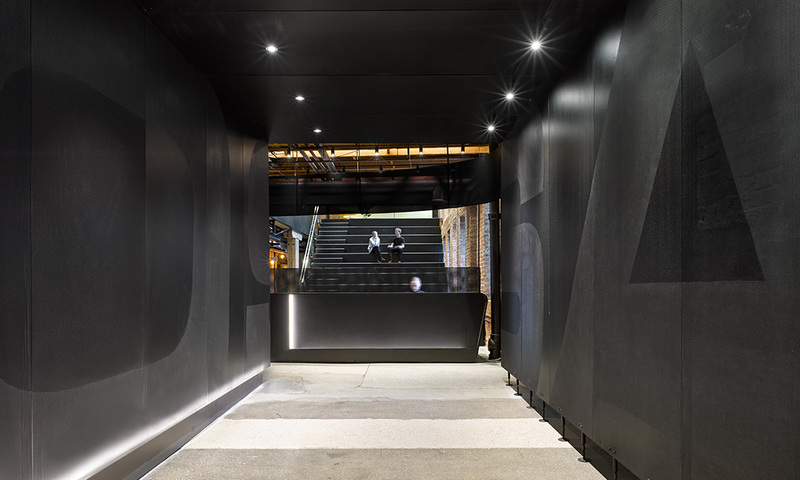 Chou’s firm interpreted the Mosaic brand into a narrative that appropriately begins at the main entrance. At the entryway is a black mesh tunnel that visually frames a set of bleacher stairs of the same material. Chou calls them “the heart of the agency.” The bleachers connecting the first and second floors are a multi-purpose area for retreat, for interaction and for gatherings. And it is the most prominent of many elements that symbolize the creativity and openness at Mosaic. The designers approached the project by first tearing down existing drywall to expose the building’s historic brick-and-beam structure. Metal mesh screens envelope the main lobby as a contemporary contrast. Still, the character of the building is never concealed. The perforated structures ensure the brick walls remain visible, which speaks to Mosaic’s brand of transparency. Beyond the main lobby lie social hubs and individual workspaces accentuated with artwork by Mosaic staff. 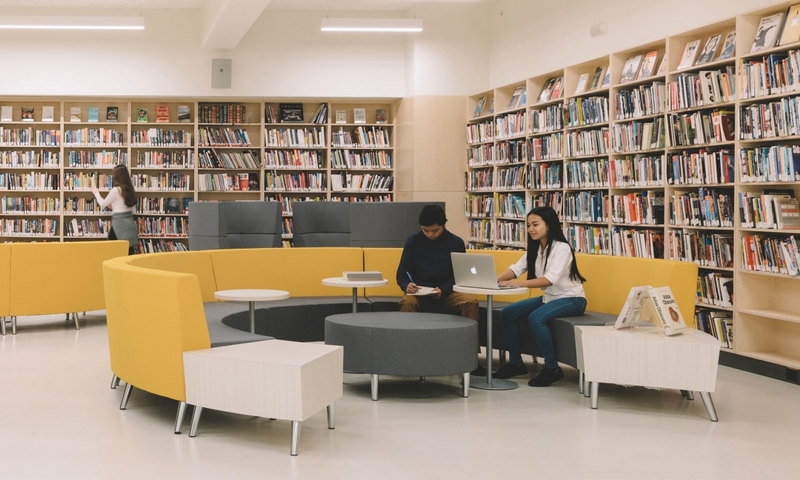 Chou and his team sourced a variety of furniture, including open workstations by Global, to create both traditional and modern workspaces that reinforce a collaborative culture. Lounge seating, enclosed meeting rooms, and long communal tables present Mosaic employees with the choice of where to work, whichever way they work best. 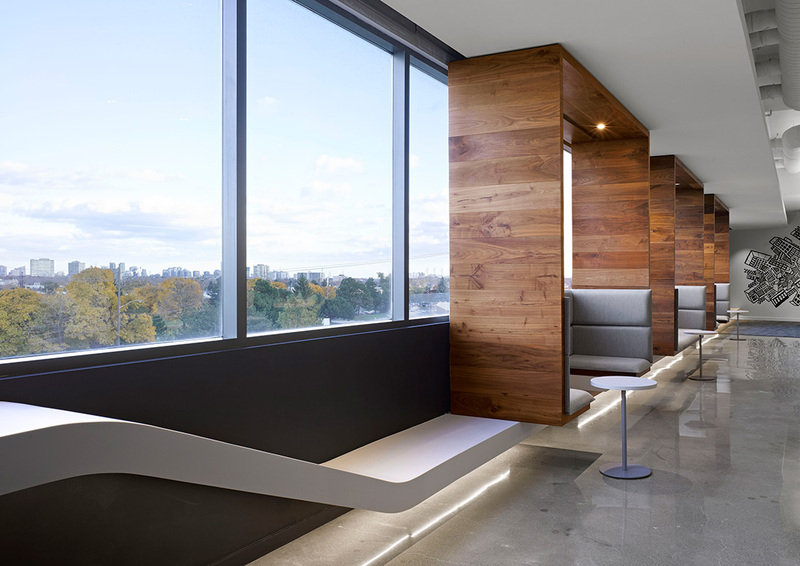 And showcasing these distinct workplace solutions is the very focus of the Global Showroom in Toronto, which earned Chou's firm recognition at Interior Design's 2017 Best of Year. River seating and tables in the lounge of Global Showroom Toronto. Benching inspiration in Global Showroom Toronto. The challenge in the showroom was creating an innovative space that appeals to visitors sourcing for a broad range of industries. “We wanted to keep the design universal,” Chou explains. Existing forms within the building designed by Moriyama & Teshima Architects helped to direct movement through the showrooms. The firm also kept flourishes to a minimum, relying instead on materiality to elevate the design.